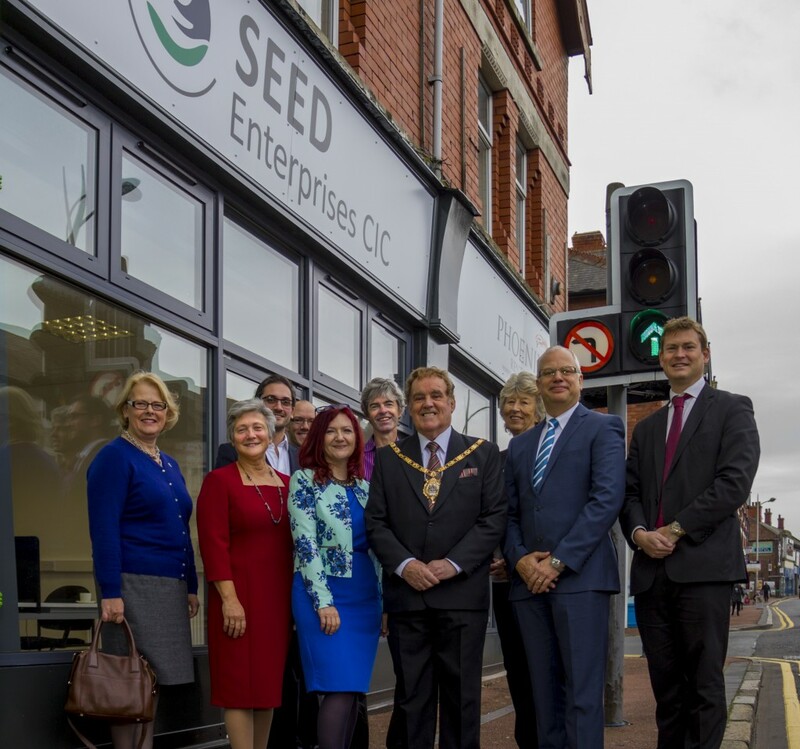 27 October 2014 – Mayor of Ellesmere Port, Councillor Brian Jones, has officially welcomed business incubator ‘Seed’ to the town’s Whitby Road. Seed is a special kind of business incubator, focussing on nurturing people with their personal journeys prior to starting up a business, invoking confidence rather than simply offering flexible desks. Seed is complementary to other social enterprises on Whitby Road and will look to build partnerships with them to support local residents and help create local economic growth. Mayor of Ellesmere Port, Councillor Brian Jones, said: “Whitby Road had a considerable number of properties that had remained empty for a long time – something I know local residents said they would like to see change and I am delighted that we are now seeing a real difference to the area. Seed is the latest social enterprise to establish itself on Whitby Road after Number 23 – a commercial property that had stood empty for five years – was bought by Rob Stewart of Phoenix Lettings last year. Rob has worked in partnership with the Council to refurbish the building creating three new shops and seven affordable flats above. The works were delivered by local Community Interest Company Access2Training&Employment to a high standard. Deputy Leader of the Council, Councillor Eveleigh Moore Dutton: “We were able to make a grant available to landlords who can then offer peppercorn rents and it’s fantastic that such admirable community projects are coming forward to make the most of it. Managing Director of Seed, Steve Horbaczweski, said: “We are absolutely delighted to be joining what we have renamed ‘Wellbeing High Street’ – working with all of our partners to support the partnership working of the social enterprises in the road, and the ongoing regeneration, capturing momentum. Cheshire West and Chester Council launched a project in 2012 looking to target long-term vacant shops in the old high street of Whitby Road. The grant scheme aims to bring properties back into use, improve the appearance of the street, help increase footfall for the other shops, and support the regeneration of the wider area. Local member, Councillor Justin Madders, said: “It was very impressive to see how the shop had been transformed since my first visit shortly after Seed purchased the premises. For further information on the project please email Town Centre Manager Jochem Hollestelle at Jochem.hollestelle@cheshirewestandchester.gov.uk. Councillor Eveleigh Moore Dutton, Geri Stewart, Rob Stewart, Val Horbaczewski, Jochem Hollestelle (CWAC), Mayor of Ellesmere Port, Councillor Brian Jones, Councillor Brenda Dowding, Steve Horbaczewski, and Councillor Justin Madders at the official opening of Seed.